Something is luring flying foxes, or fruit bats, to Tasmania. One was found in a Sandy Bay garden in May, and another grey-headed flying fox has now been found dead on power lines on the Esplanade in Somerset. Nine sightings mostly in the North of the state have been reported since April. Department of Primary Industries, Parks, Water and Environment senior zoologist Michael Driessen said it was rare to find the flying mammals in Tasmania. 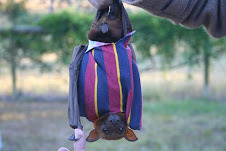 "But the flying fox, or megabat, is capable of flying the distance between Melbourne and Tasmania," Mr Driessen said. The state's first flying fox was found on King Island in 1938, and the last, before this year, was found on Flinders Island in 2004.